By now, Laura Wade is becoming a bit of a household name. The filmic adaptation of her 2010 play Posh, The Riot Clubfeatured a star-studded cast that included Jeremy Irons’ son. Equally resplendent with star-power (albeit not yet realised) was the debut of her 2005 work Breathing Corpses; it featured a baby-faced James McAvoy. Split Brick Theatre’s adaptation of Breathing Corpses has a similarly youthful cast, as each of its actors is a recent theatre graduate. The challenge posed by Wade’s script is undeniable; its narratively convoluted and boasts a range of emotional highs and lows that the newly accredited company seem a little daunted by. We found volume to be a consistent issue, with diction playing second fiddle. Lines were never fumbled though, complimenting the play’s slick scene transitions. With such a minimal set, it’s remarkable how much longevity Split Brick managed to squeeze out of the table they had on stage—it served as a container, shop front and hotel bed from scene to scene without so much as a crinkle in the play’s immersive potency. Claire McCarragher stood out too, with her subtly comic and charming characterisation lending Breathing Corpses a truly enjoyable respite from all the dead people. While Split Brick immerse us in the world of Breathing Corpses, this isn’t necessarily to their benefit. Wade has advanced her narrative ability greatly since 2005, and this is apparent after the opening scene. It’s an old play, and its thematic engagement with the inevitability of death demands a direct approach— Wade’s anachronistic narrative serves to boggle the mind of spectators and this, coupled with the sparse staging choices of Split Brick Theatre, sheds new light on the script’s glaring issues. Split Brick are an emergent, youthful company and choosing to produce a show that demands us to believe that its members are a dysfunctional middle-aged couple, or an overworked businesswoman locked in a dissatisfying relationship seems a slight misstep, particularly for what seems to be their debut production. That being said, Split Brick are certainly an ambitious group to tackle such a complex show, and to do so with such heart is even more commendable. A measured reflection on what might not have worked in Breathing Corpses would surely prompt new and exciting things from this still developing company. It is our firm belief that Split Brick have the potential to make great theatre, provided they keep at it and are more selective with their next show. Breathing Corpses is on from the 12th to the 24th of August on even-numbered days. The play starts at 15:45 each day, in Space 3 at The Space on the Mile. 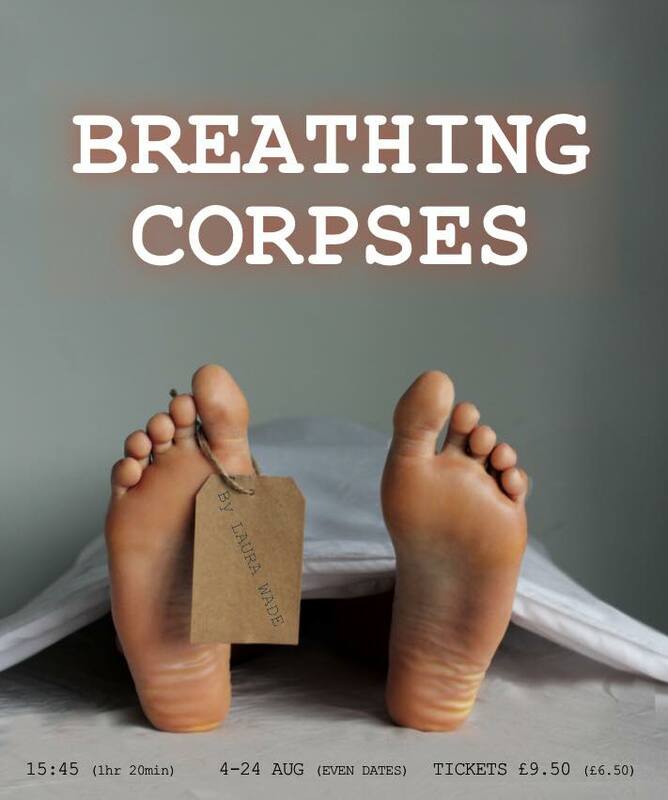 For a promising young company’s Fringe debut, STC recommends you catch Breathing Corpses before the festival is out.